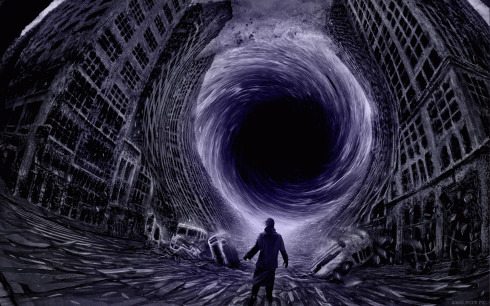 When you look too long into the Abyss, said Nietzsche, the Abyss looks into you. "And," adds comedian Brother Theodore, "neither one of us likes what we see." That's what the economic pronouncements of Republican politicians are like nowadays. Instead of a governing philosophy, all one sees is a yawning intellectual abyss. Their core ideas are so unpopular and discredited that party leaders only express them in passing. But, without them, the party is reduced to a set of rhetorical and ideological tics in search of a host organism. And, a ban on federal funding for the painting of official portraits (henceforth to be known as the "Government Officials' 'Selfie' Act of 2014"). Looking for principles in these provisions is like playing Beatles records backwards and searching for hidden messages. You may think there's meaning there -- but the more closely you pay attention, the less there is to find. Republican principles? Turn me on, dead man. Alex Pareene points out that at least one of these measures is based on a discredited conspiracy theory from radio host Alex Jones' paranoid InfoWars website, and another is based on a viral right-wing myth about the U.S. Embassy to the Vatican. The State Department was planning to save money -- which Republicans used to like doing -- by moving it to the same grounds as the U.S. Embassy to Italy, which is in the same place. In their minds, that became a measure to abolish the Vatican embassy altogether. Fans of the television sitcom Friends may recall the episode in which Joey became Chandler's roommate ... and Chandler ceased to exist. Wait, there was no such episode? The Vatican embassy wouldn't cease to exist, either. Okay, these demands were nonsensical. But the GOP still has core values, doesn't it? Last month Sen. Tom Coburn didn't like an earlier agreement, the Rep. Paul Ryan/Patti Murray deal, because "we gave up core values." Which ones? "We called non-tax increases tax increases." That's what passes for "core values" among prominent Republicans nowadays. At least the Tea Party folks do have core values, albeit deluded and frightening ones. One is tempted to paraphrase John Goodman's character from The Big Lebowski: Say what you will about the tenets of right-wing extremism, Dude, but at least it's an ethos.